Thermo-Flex Wire and Hose Insulation by Thermo-Tec is a great solution for your wire and hose heat shielding needs. 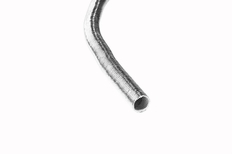 Composed of a quality combination of aluminum, silica, and stainless steel, this wire and hose insulation is light weight, flexible, durable, and capable of withstanding up to 750 degrees F of heat. It can easily by cut with a razor knife to exact lengths, or down its side to slip over wires or hoses without having to disconnect them.